Is it all that difficult for human beings to accept that people can be different (out of choice or otherwise) and love them irrespective of their religion, caste, creed, gender, race, sexual orientation? Have come across some blogs in recent times thru a blogger community which spew hatred and yet generate so many hits (responses, comments, etc) - in fact the responses generate much more hatred and this goes into an unending 'cycle'. Reminds me of popular quote "An eye for an eye makes the whole world blind." This south-Indian lady wrote about north-Indians. And generalized her personal experiences, applying them to the entire population of this particular geography. Nasty blog! I wouldn't want to comment on it but the blog generated some few thousand comments!! And this was just her 5th or 6th post! People not just commented but have written equally nasty blogs in retaliation! Few might have some sense in their blogs but are too sarcastic to make any mark on the original blogger. Its not just this incident - I used to follow two bloggers on an popular Indian daily - the Hindustan Times. And the bloggers are - Gautam and Zia. Gautam writes about religion and spirituality. Zia about Islamic commentary on current affairs. Not that I subscribe to their line of thoughts, but both blokes have some interesting points to make. Inadvertently, I was compelled to have a look at the comments too - and was disappointed every single time. Nobody ever wants to talk any sense! All full of hatred, pointing fingers at others, dissecting one religion or other (most of the times it's the only 'favorite one') and then the counter arguments to 'justify' 'our ways' to 'your wrong notions'. And these aren't the only two blogs! You'll find many many such websites, blogs and idiots. How can one harbor so much of hatred? Yesterday, I was watching a documentary on Discovery (or was it Nat Geo?) about the 9/11 Memorial Museum. Ladder 3 was one of the first responders - 12 brave fire fighters who lost lives saving others, doing their duties. Father of one of them spoke about why he felt it was important to have such a memorial. And he did not talk of hatred. He spoke of respect, peace and love. And that we should not let such a tragedy happen again, ever again. I admire such people a lot, inspite of enduring a personal tragedy, this gentleman is still advocating love and respect - it surely does take a lot of courage to be good. And its not just the people in virtual world! The even 'real' people around us! I won't get into 'the details' but there are dumbos who wouldn't understand or try to understand if someone acts or does not act in a manner. Or if someone tries not to offend by directly/bluntly refusing something and instead prefers dropping hints. I don't mind an open minded fellow asking me how, why or why not about something and wants to understand. In fact, I'd be glad to clarify. Or if someone wants to know how I feel about a thing or event. And found everyone better than me! And found none more bitter than me!! love hate are people's general feeling one can not control them, of course there should be some limit. I agree 100% with you about that blog. But, don't mind if you see your post, its kind of expressing hate towards those kind of people. So, don't take it personally. I am trying to make a point that people do hate and love but there should be limit. Like yours come into limit. Yes, I dislike 'such' people who just keeping on ranting... blah blah... yada yada... with no sense. And, yes I cannot 'control' this 'dislike'liness. I'd rather prefer that people show some respect - who says you cannot respect your enemies? 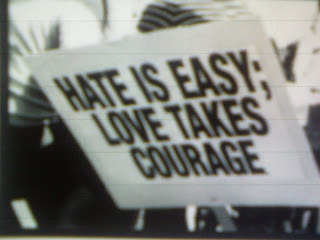 (picked up from 'Troy';)) And, I'm still using 'dislike' not hatred - life's to short for hating!! Thanks for 'tweeting' it - not bitten Twitterbug yet! !